There are about 50 different types of turtles that live in North America, with over 250 different turtle species in the world. 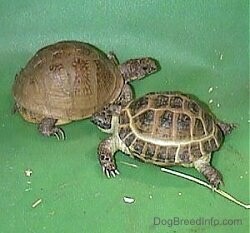 Common pet store varieties are the box turtle and the red-eared slider. The red-eared slider is mainly dark olive green with yellow/green stripes on the top of its shell, legs and face. The green color of the shell on young turtles gets covered by black pigmentation with age, making older males especially appear almost black with barely any visible markings. The male is usually a little bit smaller than the female with a much longer, thicker tail. Sliders also have webbed feet that help them swim. 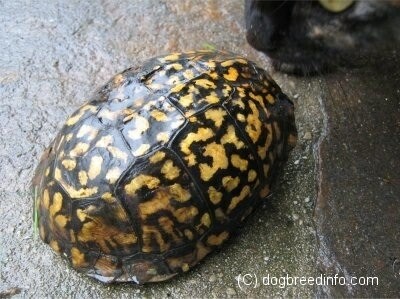 Ornate box turtles have yellow stripes on a brown shell. 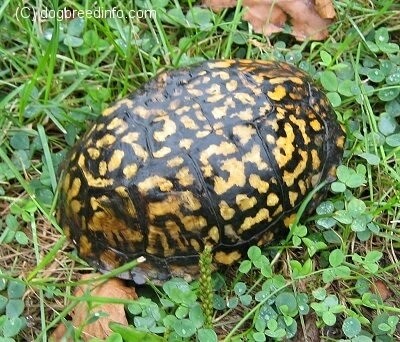 They differ themselves from the common box turtle by having a yellow line on the ridge of their shell and a pattern of lines underneath the shell. This turtle also tends to be more pugnacious than the other varieties. Three-toed box turtles are relatively small with plain brown or olive shells that may have yellow lines or marks. The skin is grayish brown to brown, with varying amounts of yellow, red, orange or white on their front legs and head. They usually have three toes on their hind feet but this is not ALWAYS true. 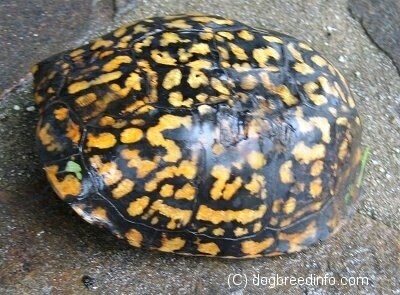 Gulf Coast box turtles are the largest of the box turtle group. The skin color is a brown to deep black, with white on the chin and lower jaw. Their brown or black shell may be marked with light yellow spots or stripes. The Eastern box turtle is among the most widely known and attractive of all turtles. Their appearance is quite varied. The color of the shell may be light brown to black, but both the shell and the skin are marked with bright yellows and oranges. Florida box turtles commonly have white or yellow radiating lines that decorate their shell, and tend to resemble ornate box turtles. Their body is longer and narrower with a higher domed shell. They usually also have two narrow stripes on their head. Turtles vary in temperament by species. Some even vary within the species. 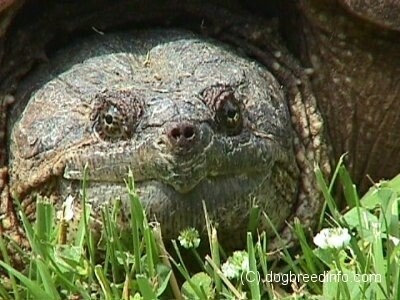 Some species are mellow like box turtles and sliders. Snapping turtles, as their name implies, are more aggressive and can give a powerful bite. They move alarmingly fast for a turtle and will tilt their shell forward as a shield to protect themselves. (This type is not recommended as a pet unless you are an experienced owner.) Still other types of turtles will urinate a foul urine with a pungent odor in attempts to protect itself. Most, but not all, types of turtles can retract their head and limbs for protection. The common box turtle will average about 4-7 inches. The red ear slider can be expected to grow to a modest 12 inches or more. On the other extreme of the turtle kingdom is the leatherback sea turtle. These mature turtles can grow to be 4 to 8 feet in length. 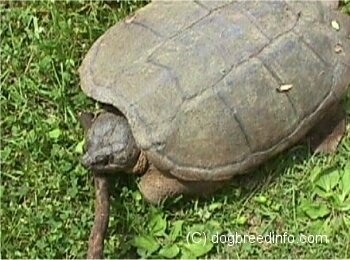 The adult Snapper will grow anywhere from 1 foot to 18 inches in langth. Your red-eared turtle will need an environment that mimics that of its home in nature. An aquarium that is approximately 5 times longer and 4 times wider than the turtle should be sufficient. It will need a warm area that is dry to bask in and water for swimming. Provide him with some sturdy large rocks that will absorb heat and provide a stable place for him to bask. Your pet red-eared turtle will eat, sleep and reproduce in his habitat’s water so it is imperative that this water be filtered and kept as clean as possible. You should also invest in a submersible heater. Plan on keeping your pet’s water at approximately 75 degrees. Provide your mature red-eared turtle with approximately 10 gallons per inch of shell. Younger hatchlings should be able to stand with their heads out of the water until they are proficient at swimming. Provide plants and environmental features for the hatchlings to rest on. The top of your aquarium should be equipped with a fluorescent light (full spectrum) that should be on most of the time your pet is awake. Box turtles prefer an open area outdoors such as a large tub or tray (3 foot by 4 foot with 1 foot walls is recommended) over an aquarium. If you place your pet into an aquarium and notice that he initially claws the walls/corners and after a few days retreats to a corner or his shell it is most likely due to frustration and stress. A stressed pet is an unhappy and unhealthy and stress can cause illness. This pet will require a larger area that he can explore and learn about as well as a place to hide. A box or overturned flower pot or hollowed log will give him a place to hide and avoid stress. Provide him with variety, such as foliage, water, rocks and basking areas. Keep his water area fairly shallow as box turtles are poor swimmers. In his basking area provide a UV heat bulb that will keep the area around 90 degrees. Provide an ample layer of medium at the bottom of his environment with pea gravel underneath to facilitate drainage. Spray his environment with warm water during the spring and summer about once a week. Keep his environment moist but not wet. During the winter, spray it twice monthly. And always be sure your pet has access to clean water. A large tub or tray (at least 3' X 4' X 1'). This can be easily made from landscape timbers. Ample substrate with a layer of pea gravel underneath for drainage. Box turtles are typically found in woods and near streams, so their diet is consistent with what would be found there: grubs, worms, insects, weeds, fallen fruit, berries and mushrooms. Some sources say that a small amount of low-protein cat food and trout chow can be given to your pet. Your red-eared slider’s diet will consist of several types of foods. Provide him with carnivorous foods when he is young, slowly introducing vegetation as he ages. As an adult, his diet should consist of small feeder fish, shrimp, earthworms, crickets, snails and mealworms. Along with this protein should be an ample amount of vegetation. Try introducing carrot tops, kale or bok choy along with collard greens. Aquatic plants, like water lettuce, are a great snack for your pet. Ask your local reptile merchant or reptile veterinarian what he recommends. 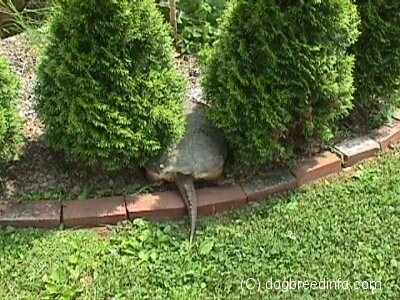 You will find that your turtle may be more agile and move a bit more quickly than you expect. Chasing live food and swimming will provide them with exercise, though some people will take their pet out of their habitat to ”roam freely” on the floor. Red-eared sliders will get a good bit of exercise swimming. You will find your turtle is most active in the early morning, late evening and during and after rain showers. Watch your pet carefully when it is out of its enclosure to ensure its safety. You pet may also be susceptible to illness this way. And as with any pet, be sure to wash your hands thoroughly before and after handling to avoid transfer of bacteria. 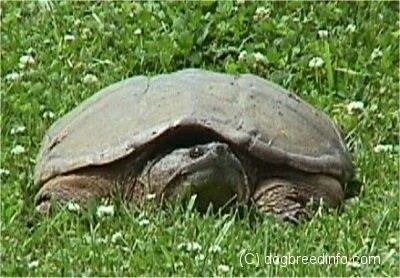 Box turtles live approximately 40-50 years. Red-eared sliders will live approximately 50-70 years. Please be a responsible pet owner and take into consideration this pet’s long life span before investing. When purchasing your turtle, look for a specimen with clear alert eyes, bright unmottled/peeling skin. He should not be lethargic or apathetic about eating. Turtles can be susceptible to bacterial infections. Properly cleanse your hands before and after handling your pet due to the threat of contracting Salmonella bacteria. These four types originate in the Eastern states, from Maine to the Mexican border. Red-eared sliders originate in mainly Southern and Midwestern states in the U.S.: Texas, Louisiana, Georgia, Alabama, Indiana, Illinois, Oklahoma, New Mexico, Virginia, Tennessee, Arkansas, Kansas Missouri, Mississippi and Iowa. Mother turtles do not lay on their eggs. Most turtles dig a nest, lay the eggs and leave them. When the babies hatch, the hatchlings must fend for themselves. A turtle's shell grows along with the turtle. 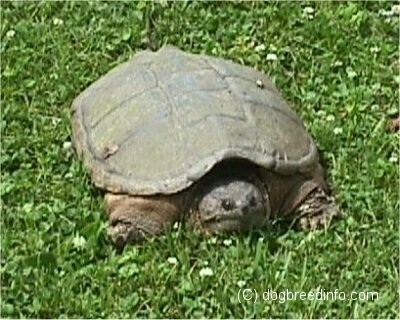 Snapping Turtle, commonly called a snapper. 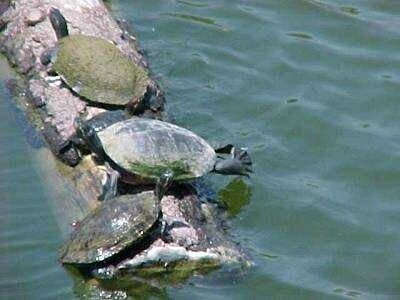 Their scientific name is Chelydra serpentina. Common snappers often reach over 1 foot in length. They grow about 4 inches a year and can weigh 40 to 60 pounds when full grown. 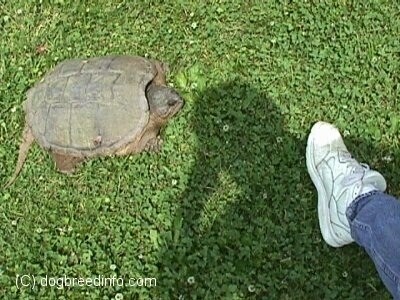 Some do keep these very large turtles as pets. 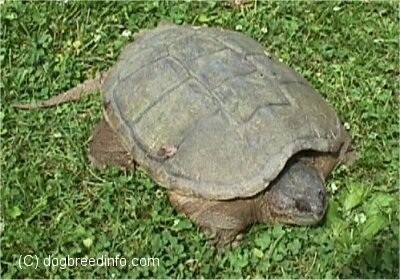 If you choose a snapper as a pet be sure you have enough room to keep them as adults. They are sometimes also made into a soup called snapper soup.